This is chapter 1 of the User Guide for the Allegro CL 10.1 Integrated Development Environment (IDE). The IDE is supported on Windows machines, certain Linux platforms and the Mac. Allegro CL 10.1 for the most part provides a unified Windows/Unix implementation. The important difference between the Windows and the Unix implementations is that the Windows implementation is closely integrated with the Windows operating system, and provides (particularly with the Integrated Development Environment described in this document) tools for producing Windows-style applications, which can be also used on certain Linux platfoms and on the Mac. The Integrated Development Environment is a windowized tool for developing user interfaces to applications. Common Graphics is the window system used by the IDE. Most symbols associated with the IDE and Common Graphics are in the cg package. The icon for Allegro CL changed in release 8.2. It was a blue bust (of Franz Liszt) and now has natural colors. The icon appears at the upper left of most IDE windows. Some illustrations in this manual are from earlier releases and so show the old icon. Others have been updated. When only unimportant details of the contents of the illustration, such as the icon, changed in release 8.2, we have not in many cases replaced the illustration. The Allegro CL Integrated Development Environment User Guide. This is the document you are now reading. It describes the tools for developing the user interface to an application. The Allegro CL Documentation. All Allegro CL documentation, including that for Common Graphics and the IDE, is online, in a collection of HTML files (except for certain add-on products documented in PDF files). The base directory for the Allegro CL online documentation is <Allegro directory>/doc/. The file introduction.htm in that directory provides a guide to the Allegro CL documentation. Clicking the menu command Help | Allegro CL Documentation displays introduction.htm. The file cgide.htm provides information about Common Graphics and the Integrated Development Environment, including information about CG and IDE documentation. The Release Notes. release-notes.htm. Included are the release notes for Common Graphics and the IDE. The ANSI Common Lisp specification. (The starting page of that document is in <Allegro directory>/ansicl/ansicl.htm.) This provides the primary documentation for Common Lisp functionality. Extensions and implementation details of standard Common Lisp functionality are described in various Allegro CL documents, particularly implementation.htm. The index in index.htm has links to this documentation. Doodler tutorial. This is a completely worked out example of using the IDE to build an application (which draws curves based on user specifications). The project is described and the steps of the tutorial are detailed in <Allegro directory>/gui-builder-tutorial/doodler.htm. Examples. There are many examples of using Common Graphics. See the Examples tab of the Navigator dialog, displayed by Help | Common Graphics Examples. (Help | Navigator displays the Navigator dialog as well). MCI (Media Control Interface) in doc/cg/cg-mci.htm. Rich Text support in doc/cg/cg-rich-text.htm. You can run the Allegro CL 10.1 IDE as a subprocess of GNU Emacs. Just start Allegro CL within Emacs in the usual way. Make sure you specify allegro.dxl as the image file (rather than mlisp.dxl, which is Allegro CL without the IDE). The :EMACS mode uses a subset of standard Emacs keybindings. Note that these may alter menu shortcuts, to prevent them from conflicting with the Emacs keybindings. Allegro CL is available in modern mode (case-sensitive, lowercase preferred) and ANSI mode (case-insensitive, uppercase preferred). Images with different modes are supplied with the Allegro CL distribution (except the Trial distribution which has only ANSI mode, through you can build a modern mode image). You may run Allegro CL with the IDE in either modern mode or ANSI mode (there are separate Start menu items for each mode). Allegro CL 10.1 also supports international characters, meaning that characters are 16-bits wide rather than 8-bits wide. (8-bit versions of Allegro CL 10.1 are supplied. No pre-built 8-bit IDE image is supplied, though such can be built.) You should not see any difference because you are using an international version. Please contact Franz Inc. for assistance if you run into problems. International character support is described in doc/iacl.htm (iacl for International Allegro CL). The modules for the IDE and for Common Graphics are separate (the separation occurred in release 8.2). The IDE is not needed in applications. The separation of CG and the IDE allows the IDE to easily be left out of an application. Symbols naming functionality in the IDE are in the ide package. The cg package has been divided into several dozen subsidiary packages. All documented symbols in the subsidiary packages are also exported from the cg package. Programmers therefore do not need to deal with the subsidiary packages specifically. Programmers will see the packages listed in the Package List window and when a symbol is described (using describe or the standard keyboard equivalent Control-Shift-D), but in general the subsidiary packages can be ignored. The subsidiary packages are associated with individual modules. This division into subsidiary packages and modules also allows applications to load only the functionality needed for the application. 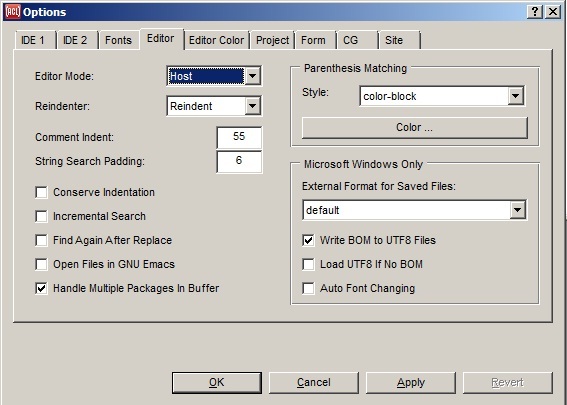 Your preferences about window arrangement, choice of fonts, editor mode, and so on are stored in a file called allegro-ide-options.cl. This file is placed in your home directory (on UNIX) or your personal documents directory (on Windows). Under some option choices, the file is placed in the Allegro directory (where Allegro CL was installed). 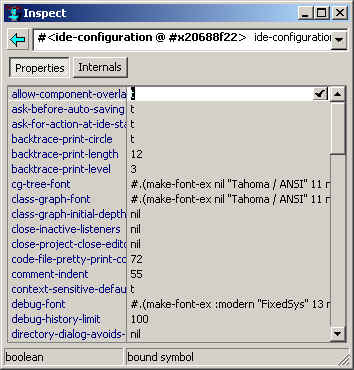 This file is updated when you exit Allegro CL (unless the menu command Tools | Save Options on Exit is toggled off), incorporating changes made using the Options dialog (displayed with Tools | Options) and when you make direct changes to the configuration using the Inspector as described just below. Deleting or renaming allegro-ide-options.cl (and deleting allegro-ide-options.fasl if it exists) will cause the IDE to revert to the initial default settings. Most details of the system are stored as the value of the variable *ide-system* (some relating specifically to the windowing system rather than the user interface are stored in the variable *system*). Send problem reports and technical questions of any type by email to support@franz.com. See our website (franz.com) for information on Franz Inc.'s mailing address and telephone number. Please state explicitly in your message that you have Allegro CL 10.1 with the IDE and say what version of Windows you are using, or the OS version for Linux or the Mac. Send us the output of print-system-state (the output includes information about patches and settings and other information which can be very helpful in determining the cause of a problem). You can use dribble-bug to write a file showing a transcript of a failure (the file will automatically contain print-system-state output). You can produce an automatic dribble along with a backtrace by doing File | Save while a backtrace pane is selected (the backtrace pane is displayed when you click on the Debug button of a Restarts dialog after an error). The saved file is suitable for including in a bug report. See the topic About submitting a bug report from a break in the IDE in the doc/cgide.htm file. See also Reporting bugs in introduction.htm. Go to chapter 2. Go to the beginning of this document.